With almost 7 million people attending Oktoberfest each year, getting a beer tent reservation is no easy feat. Lucky for you, Bucket List Events has the hook up. Travel with us to Oktoberfest for exclusive seats in a gigantic beer tent from one of Munich’s most beloved breweries. Prost! Bucket List travelers cozy up at a reserved table in the massive Schottenhammel tent. Wait… what is a beer tent? Beer tents are giant, temporary halls erected for special celebrations. These massive structures are filled with long, banquet-style tables and bench seating and are meant to accommodate huge amounts of people. They also frequently include a stage for live music, elaborate decorations, and of course, lots of beer and food to go around. Beer tents are a cornerstone of Bavarian community and cultural identity. How many beer tents are there at Oktoberfest? How do the beer tent reservations work? Each of the 14 tents have three reservation slots each day: Afternoon, mid-afternoon, and evening. Reservations are typically for 3-4 hours, and if you have a reservation, the table is yours until your time is up. Tables hold 8 to 10 people. Do I have to have a reservation to get into a beer tent? You don’t have to have a reservation to enter the Oktoberfest grounds, and you do not need a reservation to get a seat in a beer tent. But without a beer tent reservation, you’ll need to be prepared to wait. The lines are long, seating is scarce, and the guarantees that you’ll get in are nil. Why risk traveling halfway across the world just to wait for hours in line only to be turned away at the door? How do I get a beer tent reservation? You can contact each tent directly and ask for a specific date and time. Every tent has its own system for booking reservations, and they each start the process at different times. Over the course of the year they field thousands of requests from all over the world, and to be blunt, they fulfill practically none of them. Why? Because the first choice of reservations dates and times go to families and companies that have a previous relationship with the tent. In some cases, the relationships go back multiple generations! Once the smoke clears, there are practically no spots left for new customers. Furthermore, most tents require that reservation requests are submitted in German. Can we purchase just a beer tent reservation from you? No, by law a hotel is required to be a part of every booking. Of course! We recognize many people who book a tour with us end up doing so because we’re able to provide guaranteed beer tent reservations. We eliminate the possibility of getting shut out, and help introduce you to other beer enthusiasts. 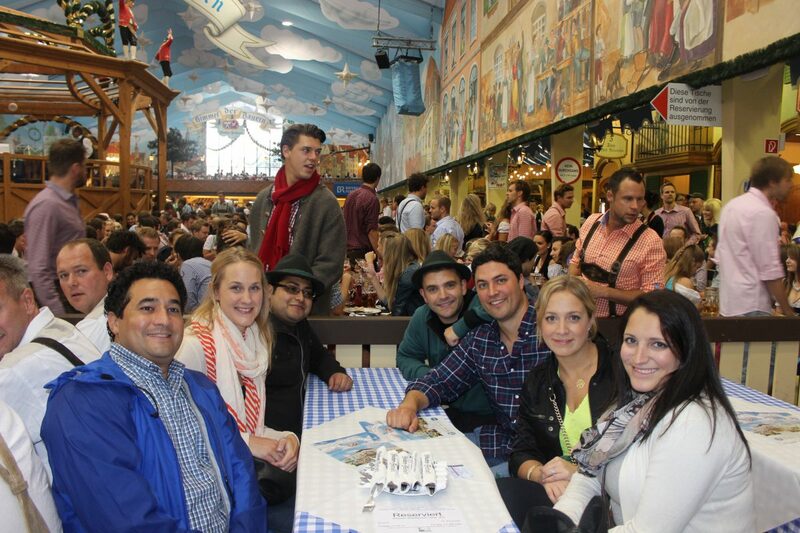 The most fun part of Oktoberfest is sharing the experience with others. Why else are you going to travel halfway across the world… to drink by yourself? It’s a great thing and it allows you to know you have a spot and enjoy it with others. Unfortunately, we cannot guarantee the time of your reservation, nor can we guarantee the specific tent. We will do our best to take your requests into account and try to provide you with what you want. In any case, trust us….don’t stress out about it. Let us take care of the heavy lifting, and you focus on enjoying the party. Many people hear about one tent or another, and tend to get tunnel vision in trying to locate a tent reservation. Truthfully there is no best tent. All of the tents have a unique aspect about them but none of them are any better than the others. Locals prefer the lesser known tents while college kids like the Hofbräuzelt. No matter what tent you are in, you’re going to have the time of your life. Just don’t drink too much and take some pictures so you remember it! Whether you’re seeking good company, good food, or a quieter atmosphere where you can sit and relax, there are tents that will cater to your needs. At Bucket List Events, we can help you make the right choice. The Ochsenbraterei Beer Tent is known for their ox cuisine dishes. If you want to eat ox, Ochsenbraterei is the place for you. 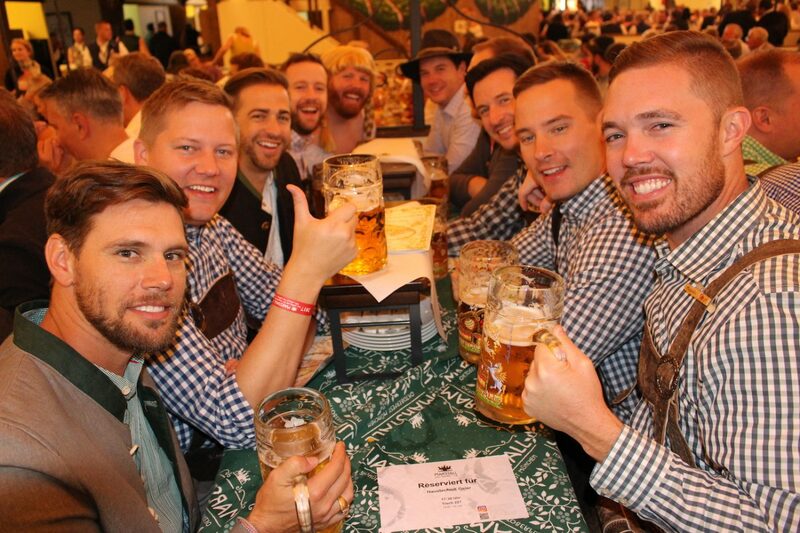 You can wash down your ox with Spaten beer and listen to a traditional brass Oktoberfest band. Just look for the beer tent with the rotating spit of oxen outside. 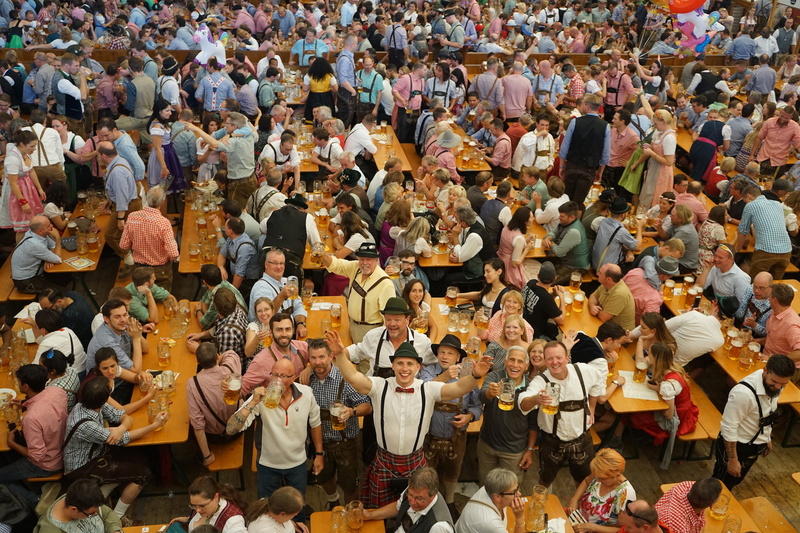 Hofbräu is one of the largest tests, filled with 10,000 Wiesn patrons. The indoor capacity of 7,000 is second largest of the Oktoberfest tents. Margot and Guenter Steinberg do an excellent job of welcoming thirsty festival-goers to the counterpart of the famous Hofbräuhaus in central Munich. The Hofbräu Beer Tent has a very diverse menu filled with chicken, pork roast, sausage, spareribs, liver dumpling soup, potato soup, knuckles of pork, Munich-style marinated beef, suckling pig, Wiener Schnitzel, roast duck and roast beef. The tent population is almost as diverse as the menu. 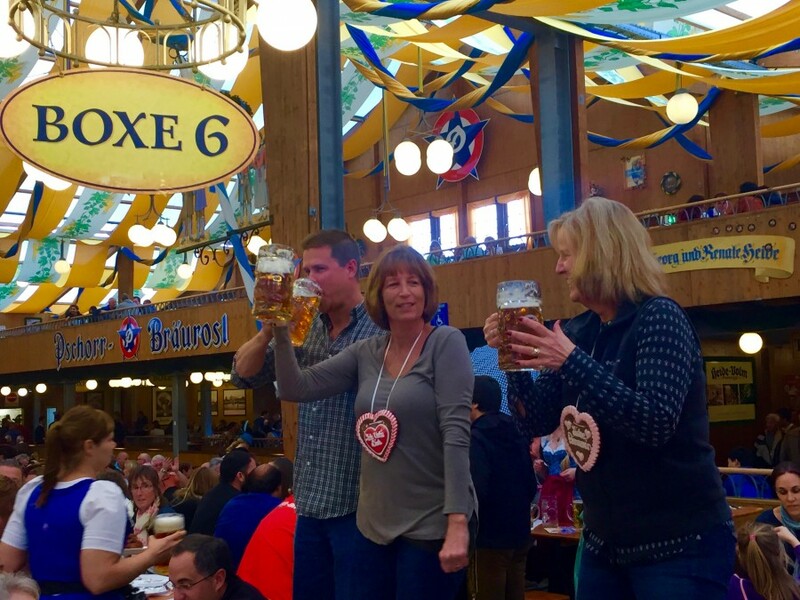 Hofbräu is popular with Americans, Aussies and Kiwis as well as locals. Everyone can sit back, enjoy the Hofbräu-München beer and listen to traditional Oktoberfest music provided by Plattlinger Isarspatz directed by Alois. The lion’s on the loose! Just follow the roar of the legendary Lowenbrau to the unmistakable Lowenbrau tower to join the party. If you’re searching for extraordinary hospitality and a crazy atmosphere, this is the tent for you. 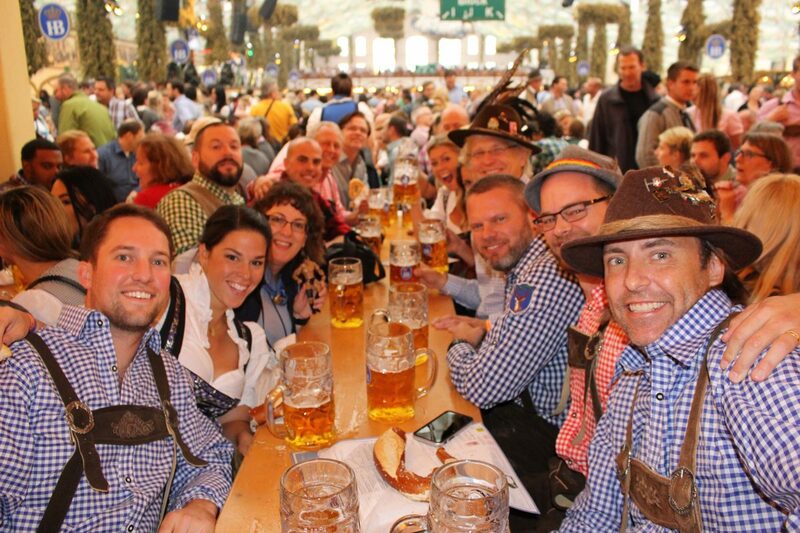 High spirits are contagious when everyone savors Bavarian treats and thirst-quenching Lowenbrau during Oktoberfest. Ok, so Käfer is the only place to go after the rest of the tents are closed. The Paulaner Beer is served 90 minutes later at Käfer than anywhere else on the Wiesn Oktoberfest grounds. The 1,900 outdoor seats start filling up after “last call” is announced at other beer tents. The 1,000 seats inside are usually reserved. So the really drunk and really dedicated end up finishing their night outside—where soup is served to keep you warm on those brisk nights. This means that while the smart people in town are in bed and passed out by midnight, the true beer drinkers continue their festivities at Käfer until 1:00 a.m. There are many Oktoberfest patrons that can blame their morning hangovers on Käfer, Paulaner Beer, and the California Sun band. Käfer is known as the most ‘upscale’ tent at Oktoberfest. Its meals are significantly more expensive (and better quality) although the waiters are notorious for the upsell…don’t fall into the trap of getting the 200 euro duck. It’s not fun. 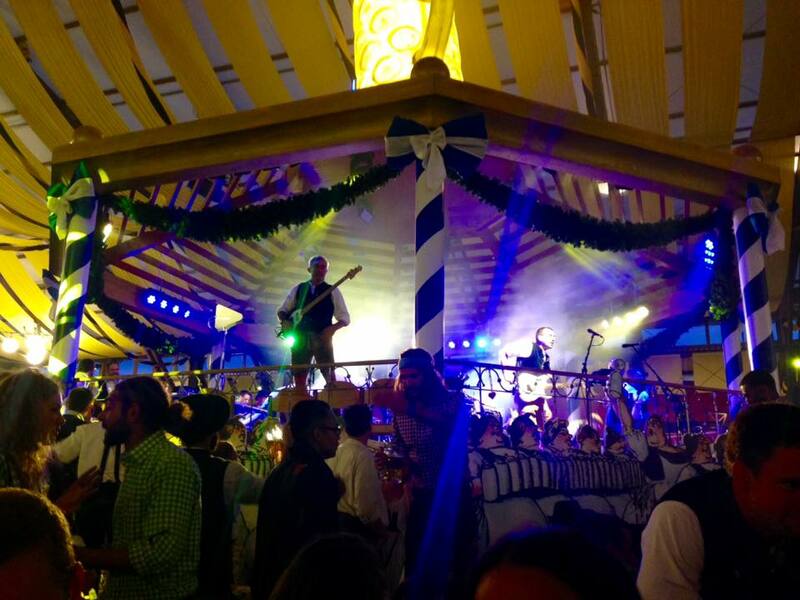 Traditional Bavarian music is played from 12 am, setting the scene for homey celebrations. From 6:30 pm every evening live party music steps up the mood, and the party in the Marstall continues until the Oktoberfest closes at 11 pm. 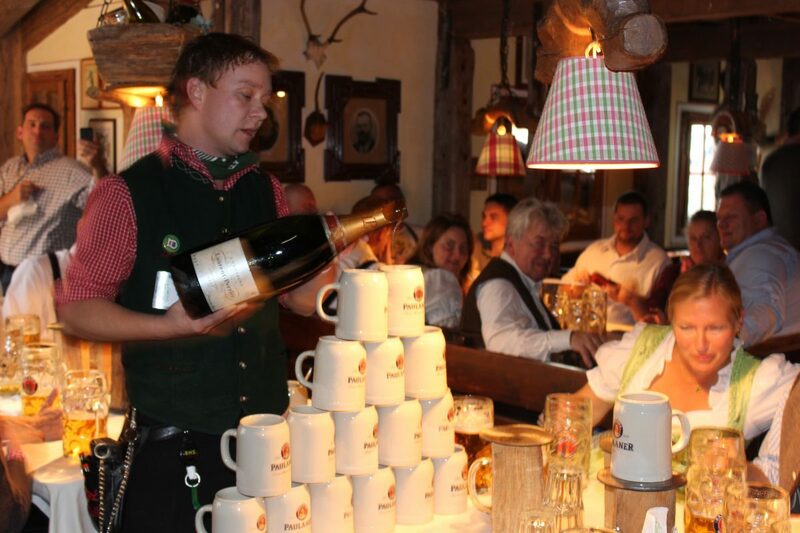 No matter how hectic it gets in the Augustiner tent, you won’t see it on the waitresses’ faces. Because this tent is considered to be the “friendliest” tent at Oktoberfest, it is often a favorite stop for families. They even have a kids’ day every Tuesday with lower prices on the beer (not for the kids, of course!). The Augustiner beer had been brewed, since 1328, for nearly 500 years in the monastery of the Augustinian brotherhood near the cathedral of Munich. After the secularization 1803 and the following privatization, Augustiner Bräu moved into the Neuhauser Straße (Road to Neuhaus) in 1817, where the famous principal firm still stands. 1829 the Wagner family took over the company, which was transferred 1885 into the “Kellerareal” (cellar area) at the Landsberger Straße (Road to Landsberg). The Augustiner Beer Tent has had the same manager for the last sixteen years: Manfred Vollmer. The Augustiner Beer Tent serves its beer to over 8,500 patrons a day from individually tapped wooden kegs rather than the Oktoberfest standard of stainless steel vats. If you want to check out a cross-bow competition while drinking a maß of beer, than Armbrustschützenzelt is your tent! Peter Inselkammer’s tent has been showcasing cross-bow competitions since 1895. So grab a liter of Paulaner beer, eat some roast chicken, knuckle of pork, or traditional sausage with sauerkraut and cheer on your favorite shooter. When the contest is done, you can listen to traditional German music with 5,800 other guests. If the brass band music of Unterbrunner Blasmusik isn’t your thing, head outside and people watch from the outdoor patio. 1,600 people can comfortably occupy the outdoor seating area of Armbrustschützenzelt. The urinals in the men’s room at Armbrustschützenzelt didn’t make a Top 10 list, but received honorable mention for “Most Fascinating.” Someone estimated 500 men could securely occupy the space. After drinking liters of cold Paulaner beer all night in a tent that holds 7,500 people, 500 urinals will be a welcome sight! Men, you’ll just have to see it for yourself. Ladies, you’ll have to take our word for it. The first thing you see upon entering the Bräurosl Beer Tent is a painting of a young woman on a horse. This is the daughter of the original brewery owner, Rosl; legend says she enjoyed riding her horse to the Oktoberfest grounds. The beer tent, serving Hacker-Pschorr beer, is named after her. If you spend an afternoon or evening at the Bräurosl tent, you’ll likely hear the traditional brass band and yodeler (Ludwig Thoma-Musicians and Sudtiroler Spitzbuam). Bräurosl is a mid-sized beer tent with room for 6,000 patrons inside and an additional 2,200 outside. The managers Georg and Renate Heide traditionally welcome a large gay population to their tent on the first Sunday of the festival. There’s some debate about whether this is an officially organized gay event, but all festival-goers and beer drinkers will have fun at this Oktoberfest tent—whether gay or straight. The Heide family has managed Bräurosl for seven generations. Who is to say that you always have to drink beer at the Wiesn? The Weinzelt Wine Tent offers a selection of more than 15 different wines, in addition to different types of sekt (sparkling wine), champagne, and of course, BEER. This is definitely the ONLY place you can get away with drinking wine at Oktoberfest. If you are male, forget about it. 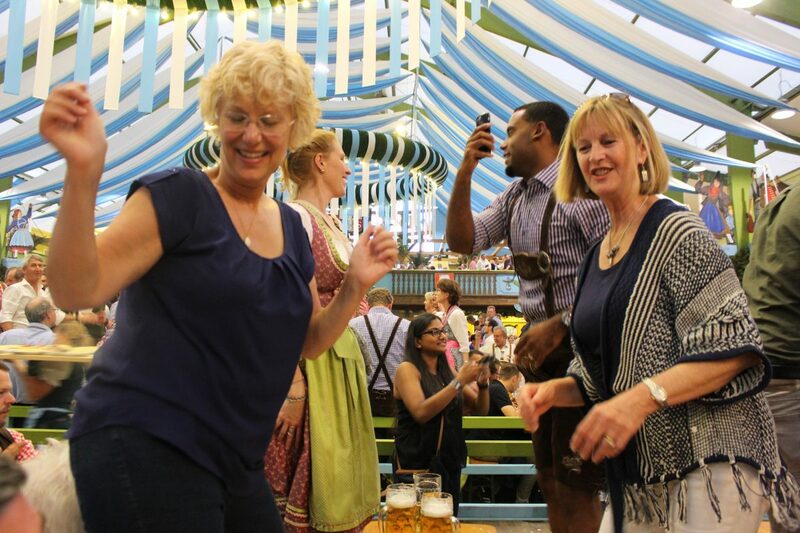 On that note, why did you bother coming to Oktoberfest…? Weinzelt is known for its three different bands and its Nymphenburger Sekt. If wine’s not your preference, you can still get Paulaner Weißbier. Managers Roland, Doris, and Stephan Kuffler do a good job of offering alternatives to the traditional Oktoberfest beer tent. Indoor seating is available for 1,300 wine drinkers with 600 more seats outside. Welcome to the oldest tent in Oktoberfest! The Schottenhamel family still hosts what they call the “most sincere” tent in Oktoberfest. There’s no room for cliques in this tent. Politicians, celebrities and students can toast together in this festival tent that holds up to 10,000 people. The Schottenhamel tent began in 1867 with a wooden shed holding 50 people. The current tent (holding 6,000 people outside and 4,000 people inside) was constructed in 1953. There are two balconies inside and 351 employees serve the Schottenhamel tent during Oktoberfest. On the opening day of Oktoberfest every year, the mayor of Munich taps the first keg at the Schottenhamel tent. At noon on opening day, the Spaten beer officially starts flowing at Schottenhamel. The music of Otto Schwarzfischer Blaskapelle starts soon after. The Winzerer Fähndle Oktoberfest Beer Tent is the largest with an inside capacity of 8,450 seats and the outside capacity of 2,450 seats. It also has a great ambience with authentic Bavarian decorations and the music of Nockherberger directed by Konrad Aigner. Winzerer is a good place to meet celebrities and Munich TV used to broadcast their Oktoberfest newscasts from this beer tent. Winzerer Fähndle is easy to find, just follow the huge tower with a giant liter of Paulaner Beer on top of it. 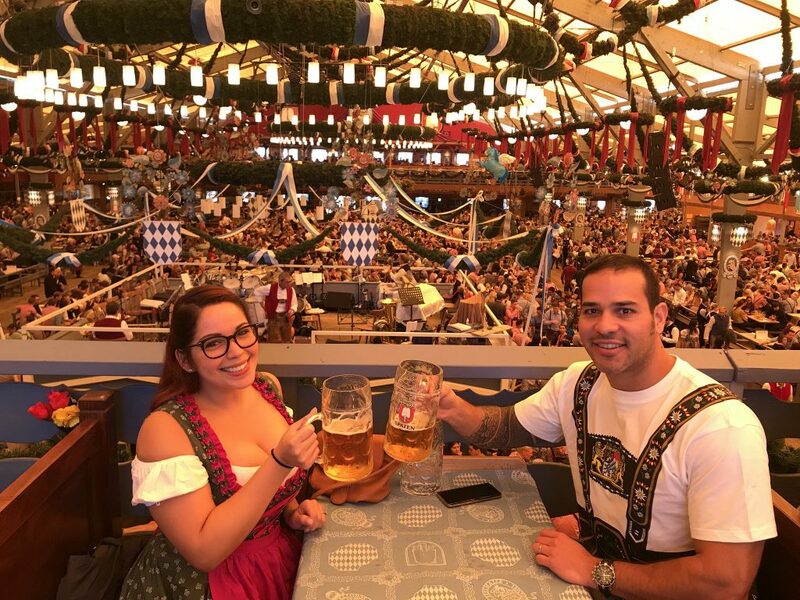 The owners Peter and Arabella Pongratz are very proud of their beer tent with authentic Bavarian detail. If you don’t have reservations at Fischer and can’t find an open seat, you can still see the 50 feet of grilled fish. It’s a sight to be seen among the busy and crowded streets of the Oktoberfest grounds. Fischer Vroni is managed by Johann and Silvia Statmueller. They serve Augustiner beer to 2,700 indoor seats and an additional 700 outside. A little on the smaller side, Fischer is still a popular tent. The music of Sepp Folger und seine Munchner Musikanten can be heard playing amid the aroma of grilled fish. Hacker Pschorr is one of the only breweries still brewing the traditional Oktoberfest Märzenbier. The name comes from the month that it’s brewed, March, and is then “lagered” until Oktoberfest in September. What goes better with a liter of your favorite beer than some rock and roll to get the party started?! If you need a break from the brass bands at Oktoberfest, get rockin’ n’ rollin’ with Hacker and the Cagey Strings Rock’n’Rock Band. The music starts at 5:30 each evening, so head over early if you want to join the fun. As you enjoy the music and Hacker beer, look around the tent nicknamed “Heaven of Bavaria”. There is a 13,000 square foot mural painted by Rodulf Reinstadler in 2004 showcasing Munich landmarks and the Bavarian way of life. There is also a unique revolving theater. Christl and Toni Roiderer manage Hacker beer tent with a 6,900 indoor capacity and 2,400 outdoor.